I learned in school that democracy was "rule of the people, by the people". Basically, people vote and elect representatives to make their laws. How can one access the quality of a democracic system? The percentage of voters who's votes DIRECTLY contribute to the election of members of parliament would be a good measure of democratic quality. I lived under the STV system in Ireland for 36 years and I find it to be a good system. Actually, I think it is a great electoral system. It is entrenched in Ireland and the system is very slowly spreading to other countries. BUT political parties don't like it and this slows down the spread of the system. Inferior systems like MMP have more success with the political establishment because they give political party leadership (at the expense of individual voters and of party candidates) more power. So rather than have the world taken over by an inferior system, I think STV should be married to MMP. My system is probably quite different than normal MMP in the way that it is counted and perhaps it corrects a few little problems in the STV system too. The problem that it corrects is a wasted votes problem. In STV in the irish multi seat constituency's, some votes end up wasted, they don't elect anybody. It would be very useful if you go to the website that I link to below to illustrate the point. The first constituency it shows is carlow kilkenny which elects 4 people to parliament. If you click on next count, it shows the redistribution of votes as surpluses are distributed and the devil takes the hindmost. Click again and another candidate gets redistributed until you end up with 5 people. Jim Townsend and the 10615 votes that ended up with him get eliminated! As you can see from the coloured bar chart, most of those votes were labour party and green party votes. In that constituency, labour and green party voters did badly. The HOPE in STV is that these wasted votes being average out between the parties in the about 40 constituency's in the country. My system doesn't leave it to random chance. Why not count all the wasted votes in the country? If 20% of the votes fall into that category, give 20% of the seats from them. And award them to the party of the FIRST party affiliated candidate expressed on each ballot paper? And then give the party's their additional seats in proportion to their share of the wasted votes. (Such a system would also include exhausted ballots that didn't transfer as wasted votes). For instance, at the linked site, someone who voted 1 Tom Kiernan (sinn fein) and didn't put a second or 3rd choice would have wasted their vote under classic STV but in STV-MMP their vote goes into the sinn fein MMP pile and helps elect a sinn fein candidate from their party list. I believe such a system has a good chance of correcting some little failings in STV. Small party voters traditionally struggle to elect people in the constituency's. If they just put 1, 2 their party candidates, their party is sure to get the use of their vote! And there is no point to the large parties trying to reduce the district magnitude to eliminate the small parties. (a traditional STV strategy for them). After all, if your vote does not elect anybody, who is going to protect your interests in parliament? Probably nobody! The Image below compares representation from a recent election in the republic of ireland with one in the province of BC Canada. The differences are obvious and glaring! 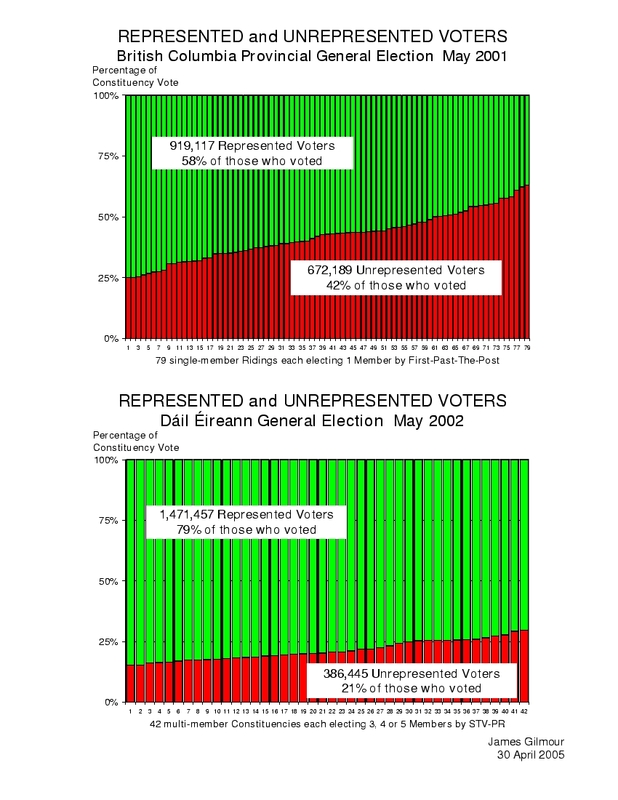 The republic of Ireland uses a voting system called the single transferrable vote. It is loved by the people. On at least 2 occasions in the past, the largest party tried to replace it with the straight vote and got resoundingly turned down in referendum. In the system, you vote,1,2,3, etc, in the order of your preference to elect members of parliament. We (for I am Irish) have multi seat constituencys. When I was there, I voted in a 5 seat constituency, and it might typically elect to parliament 2 each from the larger 2 partys and one from a smaller party. I now live in Canada where governments are elected using the straight vote (winner takes all). It is, quite simply, government by the largest minority. What a perversion of the democratic ideal that is! In the provence I live in, BC, the new provincial government won just over 50% of the vote and took all but 2 of the seats! (and they came within a hair of winning those two). What an unsafe situation! These guys have the whip hand for the next few years with nobody to question their moves. Indeed, in a homogenous country, if there were were 3 evenly matched partys, it would be possible to win a huge majority with a 35%, 33%, 32% split in the voting! Canada, the USA and the UK uses voting systems that could yield a huge winner under those conditions!! The rest could become "the silenced majority" in this travesty of a democratic system and it often happens to some extent. Isn't it time to waken up to the danger? I did not realise until I came to Canada, that election disasters happen all the time! In the previous BC elections, a majority of seats was won by a party that came second in overall votes! Mammoth partys mushroom overnight into powerful governments which disappear without a trace at the next election! I should not say ,without a trace, because with each lurch to the left or to the right, Canada or one of its provences is economically devestated. BC is many times bigger than the republic of Ireland, but with the same population. I do not think the standard of life is any better here despite having so much more resources per person. Perhaps it is because of having a strange voting system. British Columbia election (%represented voters) and standard deviation Check and compare the charts. There is a marked difference!